If I could dunk on anyone, I would dunk on the owners of Castle Fun Park in Abbotsford, BC. This is a no brainer. They are most deserving of the dunk because of their particular brand of evil towards children. You see, these demons are in possession of a 12″ television from 1989 and have the audacity to charge 15,000 tickets for the right to take it home. In my time at Castle Fun Park, I’ve found that your dollar to ticket ratio is almost always 1:1. The absolute best player that I’ve ever seen could perhaps maybe coax three tickets for every dollar spent on the various games of skill in the Castle Fun Park Arcade. 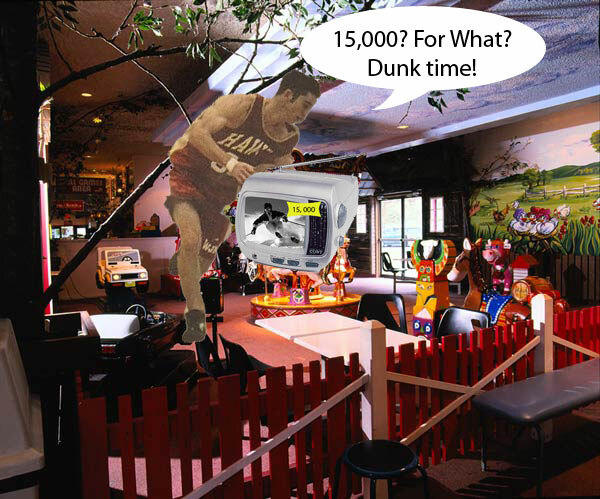 Roughly speaking that means that the greatest skeeball player on earth would still have to spend $5,000 to win a 12″ box TV. Often times, I will drive to the top of a mountain, sit on the hood of my car and think about all the children who wished that they could have their OWN tv in their own room. But Castle Fun Park operated just like their claw machine by giving a child hope and then snatching it away, leaving the child to walk away with nothing but pain and empty pockets. To make matters worse, the TV was never turned on so there is still a good chance that it’s black and white! I would roll the ball down the lane and it would land in the 500 points column, but then due to some magic properties that are too complicated to explain it would start bouncing up and down in mid air! My score would be tremendous! As the owner looked on in horror, he would see the vast pile of tickets accumulating at my feet faster than he could count. When I reached 15,000, my gold ball would return to me and I would hand it off to some smokin’ hot girl with a fancy case for the ball. I would then hand over my tickets for the television. As soon as the owner handed it to me, it would turn on. Everyone at the arcade would be so shocked because it’s not even plugged in! It would be tuned to French CBC. This is to prevent the crowd from getting distracted. He would walk out onto the court and be all nervous. At this point all the kids are going crazy and looting the prizes! They are taking plastic spiders, cheap rings, and those airplanes made out of styrofoam. But they know to leave the best stuff for me. I would raise one fist to silence my crew. Then, I would make my way to the net, yeah, I’m travelling but you can’t dribble a TV. As I finished the dunk I would release the TV and it would land on the head of the manager. It wouldn’t kill him but it would leave him with a scar that looked like a “K” so he could never forget. Just to be safe, a local photographer would get a picture of this dunk and it would be front page of the Abbotsford Mission Times and some cereal guy would see it and create a new cereal called Kenny Flakes and would use this image. And it would be the most popular cereal in BC history. Then the manager would be like “oh please Kenny, don’t dunk on me again,” and he would totally give me a lifetime pass so that I never had to pay the batting cages or air hockey ever again. man i know this place. their go kart prices are unfair! I’m sorry, but no one who played for Mouat averaged 19 and 7. Haha good try though. Earl Marriott on the other hand was a fine team in 2001.